Fat is in! I like finding tasty ways to incorporate more healthy fats into my diet. 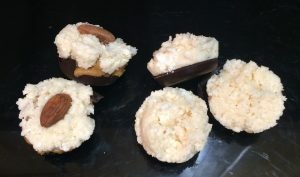 My Coconut Fat Bombs are a great way to appeal to different tastes because they are so easy to modify from the basic recipe with your favorites. I’ll put the basic recipe here then show some of the ways I like to change it up in step #5 below. This is Restart/Sugar Detox friendly as well! pour into small baking tins or candy molds and freeze until they set up. The basic recipe is gluten free, dairy free, sugar free and nut free. ENJOY!